When evaluating rotator cuff treatment options, patients might believe that surgery is the only way to find much-needed pain relief. However, adult stem cell therapy (in which a physiatrist extracts stem cells from the patient’s own fat tissue or bone marrow, processes them, then re-injects them into a target site) provides patients with a minimally invasive option for significant quality of life improvements and overall physical gains. The procedure itself is completed within a single day. At Florida Spine & Sports Medicine Center, we can process and re-inject stem cells within a single appointment. Patients are often free to leave immediately after the injection. Should they opt for a more aggressive rotator cuff surgery, patients might need to put their lives on hold for post-operative monitoring, or even an overnight stay. The rehabilitation period is much shorter. Stem cell patients can typically continue with their normal daily activities after the procedure. 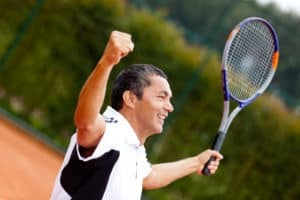 Strenuous physical activity is an exception; the complete repair process takes approximately three to six months, during which time overuse can negate the benefits of the stem cell rotator cuff treatment. The benefits can begin to appear within a week of the treatment. Most patients see a reduction in pain and inflammation during this time. (As noted above, however, the complete internal recovery can take up to six months.) This treatment is much more comprehensive than a simple pain pill prescription for your torn rotator cuff. The likelihood of complications is much smaller compared to more invasive surgery. Because stem cell infusions are non-surgical procedures, patients don’t have to worry about blood clots or an infection at an incision site. Even better, there’s no implant that’ll require replacement several decades down the line. If you’re interested in learning more about our innovative rotator cuff treatment options, our Board-Certified Physiatrist is available for a free consultation. Call us today to make an appointment at one of our convenient treatment centers.